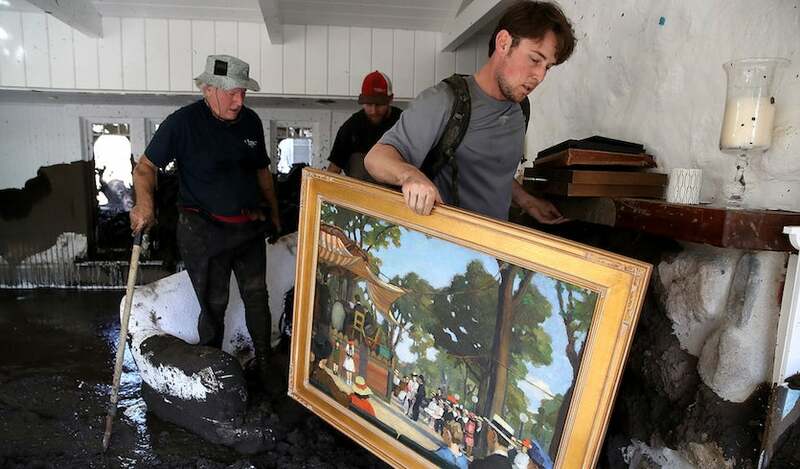 Above: Robert Drenic carries a painting from a family member’s home destroyed by a mudslide on January 11, 2018 in Montecito, California. 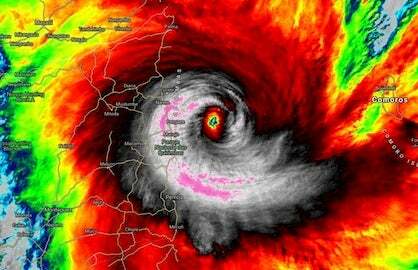 At least 21 people were killed and hundreds of homes were destroyed or damaged. Heavy rain falling atop fire-scorched land upstream from Montecito triggered the mudslides. Image credit: Justin Sullivan/Getty Images. Abrupt transitions in California from a parched winter to a soggy one, as observed in the mid-2010s, will become more common if greenhouse gases continue to increase, according to a study published Monday in Nature Climate Change. This “precipitation whiplash” has implications for both wildfire and flood risk. The research also suggests that California’s wet season is likely to contract, and the shorter wet seasons will become more variable, with an increase in both extra-dry and extra-wet winters. 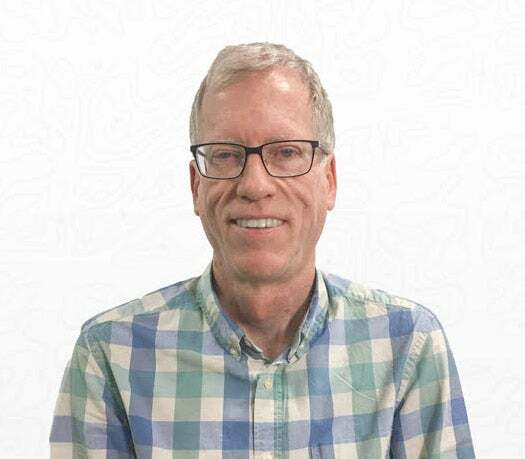 Led by Daniel Swain (University of California, Los Angeles), the study employed 40 climate simulations from the NCAR Community Earth System Model. This large ensemble (CESM-LENS) has been used to simulate climate in preindustrial times as well as the 21st century. Swain and colleagues examined output for the high-emissions or “business as usual” scenario (RCP8.5). It assumes that fossil fuel burning will continue to add ever-increasing amounts of greenhouse gas to the air until the late 21st century. One of the most worrisome findings is an enhanced risk of extremely wet winters. The modeling indicates that 40-day-long rainfall stretches on par with those observed during the “Great Flood” winter of 1861-62 will be more than three times more likely by the 2070s-2090s than they were prior to human-produced greenhouse gases. A large swath of California’s Central Valley was inundated in early 1862 by torrential rains that produced more than 10 feet of flooding, putting downtown Sacramento under water. 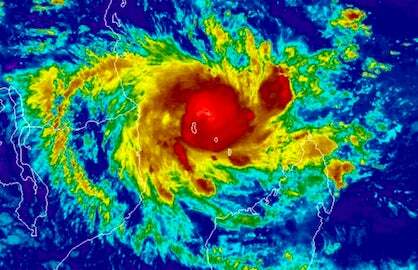 A study called ARKstorm found that a repeat of this event could produce hundreds of billions of dollars in damage. California’s ongoing flood control improvements may not be enough to handle this type of megaflood, as reported by Eric Zerkel in weather.com’s “United States of Climate Change” series. Figure 1. 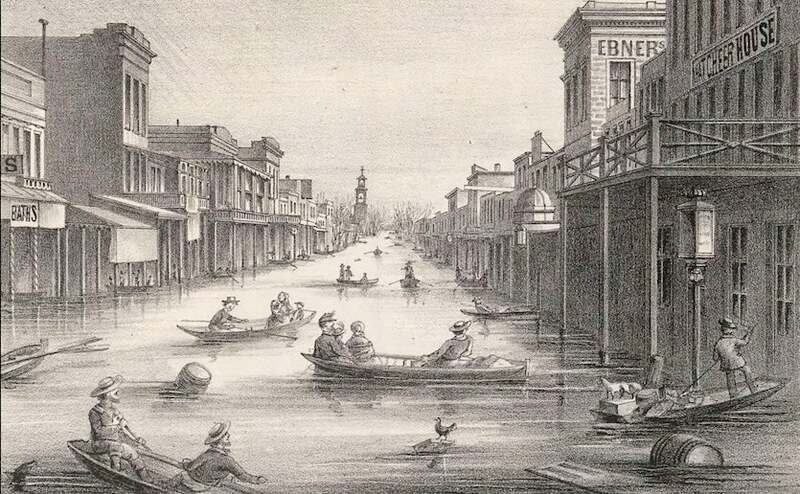 A lithograph of K Street in Sacramento during the Great Flood of 1862. Image credit: A. Rosenfield, via Wikimedia Commons. "On a statewide basis, the overall frequency of 1862-magnitude events increases on the order of 300–400% by the end of the twenty-first century," write the authors. “Strikingly, these findings suggest that California’s major urban centers (including San Francisco and Los Angeles) are more likely than not to experience at least one such extremely severe storm sequence between 2018 and 2060 on a business-as-usual emissions trajectory." Figure 2. The wet season gets scrunched: Changes in California’s monthly average precipitation at the end of the twenty-first century (2070–2100) as compared to preindustrial conditions, both assessed from the NCAR Community Earth System Model Large Ensemble. Results are shown for each calendar month for a range of latitudes spanning the California coast from 32.5°N to 41.9°N, with the latitudes color-coded. Percentages in the legend denote relative changes in mean “seasonal sharpness” at each latitude, defined as the ratio between precipitation falling during the core rainy season (November–March; blue background shading) to that cumulatively falling during the shoulder seasons (September–October, April–May; red background shading). Image credit: From Swain et al., “Increasing precipitation volatility in twenty-first-century California,” Nature Climate Change 2018, courtesy Nature Publishing Group. The new study builds on previous work that focused on long-term trends in average California precipitation. For example, a major NOAA report in 2014, “Causes and Predictability of the 2011-14 California Drought,” attributed that prolonged drought (which ended up going into 2016) to natural variability—though the authors noted that the record-setting heat accompanying the drought was likely made more extreme due to human-induced global warming, thus worsening the drought impacts. 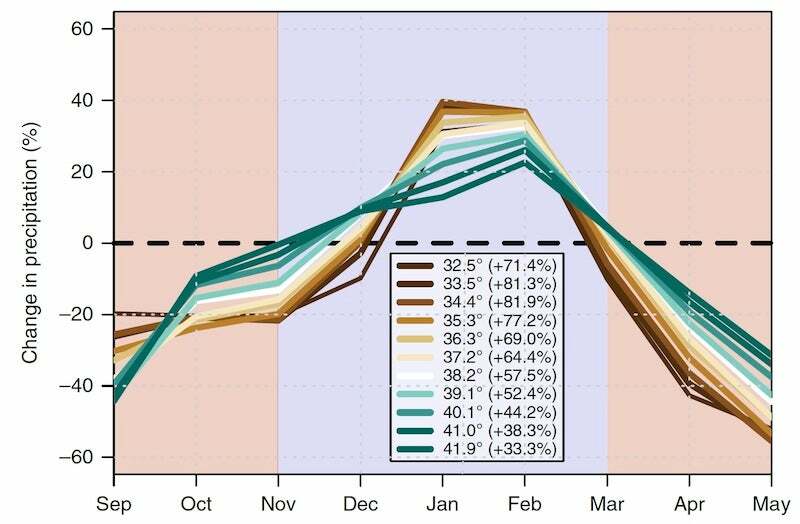 NOAA's 2014 study noted that models used for the most recent IPCC assessment predict an increase in California’s average midwinter precipitation, as does the NCAR model in the new study. However, the 2014 report did not examine trends in year-to-year precipitation whiplash. The new study examined trends in dry-to-wet whiplash from one year to the next, but not in wet-to-dry whiplash. Swain said he would expect both types to increase. Wet-to-dry whiplash is a recipe for fire trouble. A wet winter in California can foster a richer-than-usual carpet of grasses and shrubs. The bumper crop, along with forests, may then be dried out quickly by very high summer temperatures—which are occurring more often with California drought, exacerbating its impacts. In 2016-17, the second-wettest winter in California history was followed by the hottest summer on record, and then by one of the slowest-starting wet seasons on record. The lack of autumn moisture set the stage for deadly wildfires that devastated parts of northern California in October 2017 and the Santa Barbara/Ventura area in December. Figure 3. 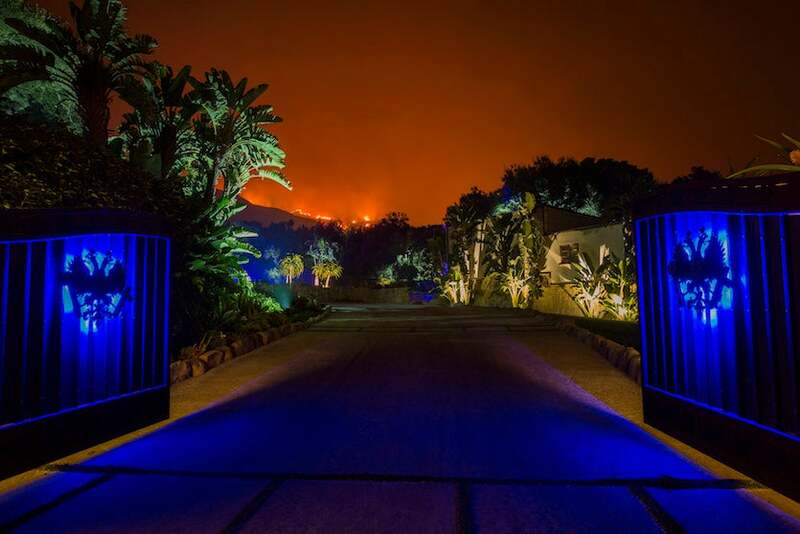 The glow of approaching flames is seen at the gates of a home in Montecito, California, as the Thomas Fire continued to grow on December 12, 2017. Eventually spanning more than 281,000 acres, the fire was the largest in modern California records, destroying more than 1000 structures. Only a month after this photo was taken, Montecito was ravaged by flash floods that took at least 21 lives. Image credit: David McNew/Getty Images. One caveat to the new study is that NCAR’s large-ensemble runs are at standard resolution for global models, so they do not have high enough resolution to depict atmospheric rivers and other such features in fine detail. 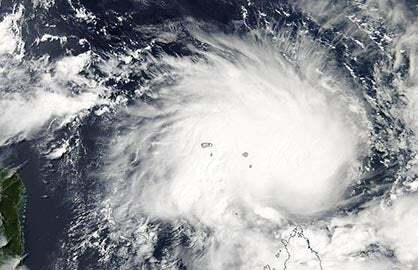 As a result, Swain said, “We can’t be specific about precipitation amounts.” Instead, the study used an 1800-year-long control run with preindustrial conditions, then determined the most intense storm one might expect every 200 years (analogous to the 1862 event) and assessed how much more often such a storm occurred in the 21st-century runs. The new analysis did not find any increase in the frequency of multiyear dry spells in California until very late in the century over far southern California. Even so, rising temperatures would still tend to make the impacts of any single-year drought worse, and the contracting wet season implies a longer period each year when dryness will prevail. A paper published online last September in the International Journal of Climatology reported on an increase in both wet-to-dry and dry-to-wet whiplash from one winter to the next across California and Nevada since 1895. The study, by Michael Marston and Andrew Ellis (Virginia Tech), defined this phenomenon as “extreme precipitation reversal” and found greater EPR values in the second half of the historical record. Oklahoma has also been plagued by wild swings in precipitation in recent years, as we discussed in a recent post on a massive wildfire in mid-April. The state experienced its wettest year on record in 2015, and far northwest Oklahoma saw its driest winter on record in 2017-18. WU weather historian Christopher Burt has a post with meteorological background on California’s Great Flood of 1862. The Los Angeles Times investigated the risks of catastrophic California flooding in a report on March 25.